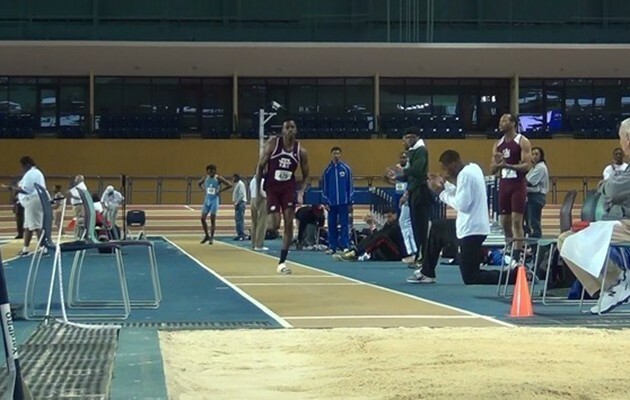 BIRMINGHAM, AL – The Texas Southern Tigers had one of their best first day starts in the SWAC Indoor Track and Field Championships in more than a decade. The men’s track team is in second place with 30 points, and their best events are yet to come. Aaron Rodgers played a huge role in the Tiger’s first day success. Rodgers and Drayton Rolle finished 1-2, respectfully, in the men’s long jump for 18 total points. Rodgers captured the SWAC Indoor long jump title with a distance of 7.12 meters while Rolle took the silver with 7.09 meters. Rodgers also took the silver in the high jump with a 1.98 meter clearance which gave the Tigers 8 more points. The TSU Distance Medley Relay (Jose Vega, Quiller Gray, Tarence McElroy, George Alvardo) picked up 3 points for their sixth place finish with a time of 11:09.32. Greg Brady, a football lineman turned track and field thrower, took 8th place in the men shot put with a distance of 13.21 meters. He also earned the Tigers 1 point by placing. Traditionally, Texas Southern’s big payoff came during the running events on day two. TSU is poised to make some noise on the final day of competition. They trail Prairie View who leads with 48 points.